Last time I built the blocker you see in the photo, see my previous post. http://blog.workingsi.com/2011/05/ir-led-speedred-light-photo-blocker.html. I'm playing with technology to ruin the plate photo taken by speed and red light cameras. This would also apply to automated police license plate screeners, toll collectors like EZPASS, etc. Last time I learned a lot and made some mistakes, so I'm amping it up a bit to try to make a more effective design. I won't repeat the backstory in the other post. This post I'm going to take a more scientific approach and pull out all the stops. This is just for fun and education and I have no intention that I or anyone else will use this for inappropriate purposes. This is just a playground for technology. Last time I focused on making a plate out of cheap components that was easy for anyone to build. I used a cheap plastic license plate frame and TV IR diodes. The end result looked totally innocuous and was fairly effective in messing up photos taken in lower light, but not so great in broad daylight. Now I'm going to try to take this to the next level. This high power LED is $12, but is 10X more powerful and has a wider field of view than the TV remote IR diodes. http://media.digikey.com/pdf/Data%20Sheets/Osram%20PDFs/SFH_4232.pdf. As a bonus it is 850nm, the closest I can get to the visible wavelengths, so the cameras will be more likely to be highly sensitive to those wavelengths. I bought four, because I didn't want to shell out the money for more until I know it is going to work. I needed at least 4 for the series circuits I will show below. I missed these LEDs on digikey before because they are surface mount and have a different form factor than a traditional LED, and I was sorting by package. That is a lot to pay for an LED, and is slightly less cost effective in light/dollar, but the hot spot would be very small and bright. One downside I noticed when I got the parts, is that it appears the LEDs are not sealed up. There is no lens on the top of the LED, so for the road, they would need some sort of lens or cover. A problem for later. Another choice is on ebay from overseas sellers. Twice the power, but still looking for real data sheet and it seems kind of fishy and over rated. It may be the same component. These diodes run at 1A instead of 100mA, and can handle surges up to 5A . With 100mA I had plenty of trouble last time keeping the power in each component in it's rated range using a resistor as a current limit. I was dropping 3V at 100mA in the resistors, so with 300mW the 1/2W resistors still get pretty hot. I did learn that it is most efficient to put multiple LEDs in series. 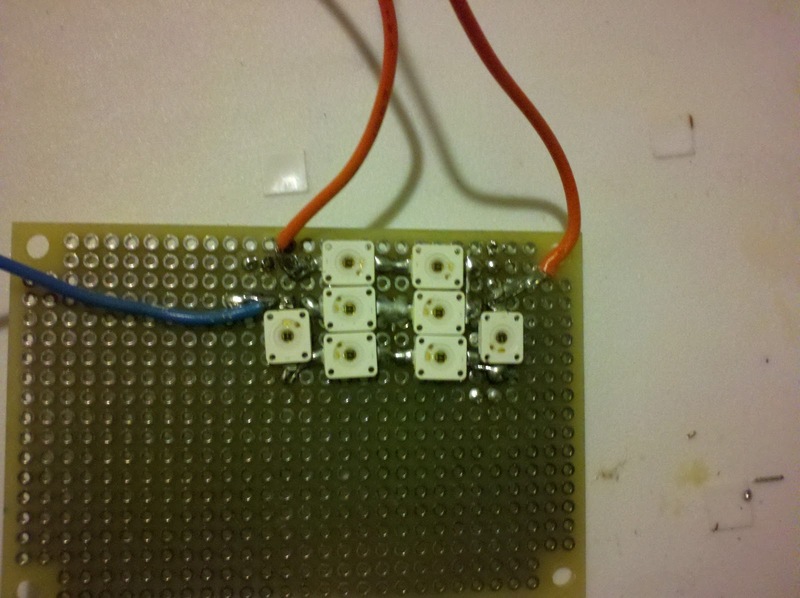 Last time I put chains of 6 together, which was 1.5V * 6 = 9V, and the remaining 3V dropped across a 30ohm resistor. That won't work well at 1A, I'd need a 3 ohm resistor and I'd need resistors rated for 3W! 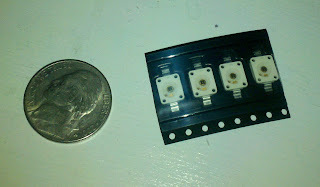 These are small enough that I could mount an array of 4 or 8 of them without drawing any attention. 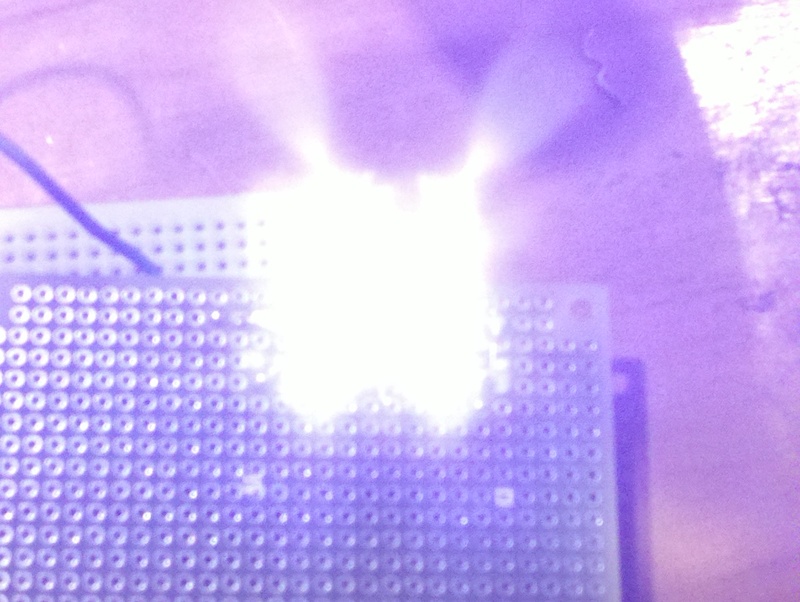 Also the high power LEDs have a slightly higher forward voltage, so I can't put as many in series. Generally people drive these big high power LEDs with switching circuits. I can dump 5A peak through these and switch it on and off with a duty cycle of 20% and keep the steady state average to 1A. 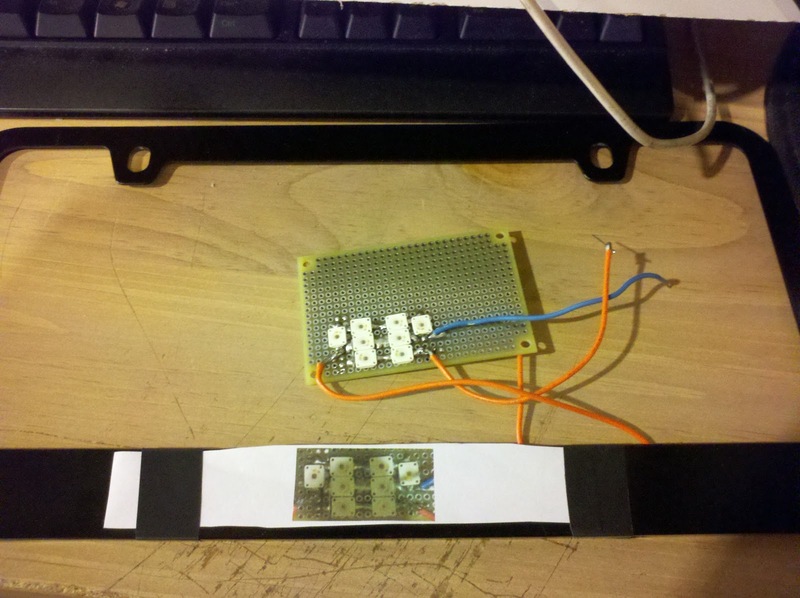 It is a lot easier to control pulse width than it is to build a constant current source at 1A. That would require an amplifier to regulate with feedback and lots of high current parts. I need to keep the frequency of switching in the >10kHz range to make sure the diode is on longer than the frame time of the camera so I'm certain it appears on in the picture, especially when it is bright out. The other thing I learned is that heat is a big problem, and at 1A it is going to get very hot. So this time I will use a nice blank metal license plate frame that will act as the heat sink. The license plate will also be part of the heat radiator. Generally I'm going to be dissipating 1A * 2V * 4 LEDs = 8W per string, with two strings this is as much power as a LED light bulb for your home, and those get really hot. I need a good metal license plate frame. I was planning on using black like this one, when I had black plastic IR LEDs. I'm going to drill out holes for the LEDs to shine through, and possibly mount a power switching transistor onto the metal frame as well. 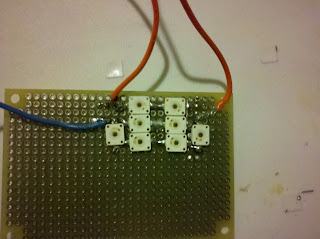 This is the initial test circuit I will use to start powering the LEDs. 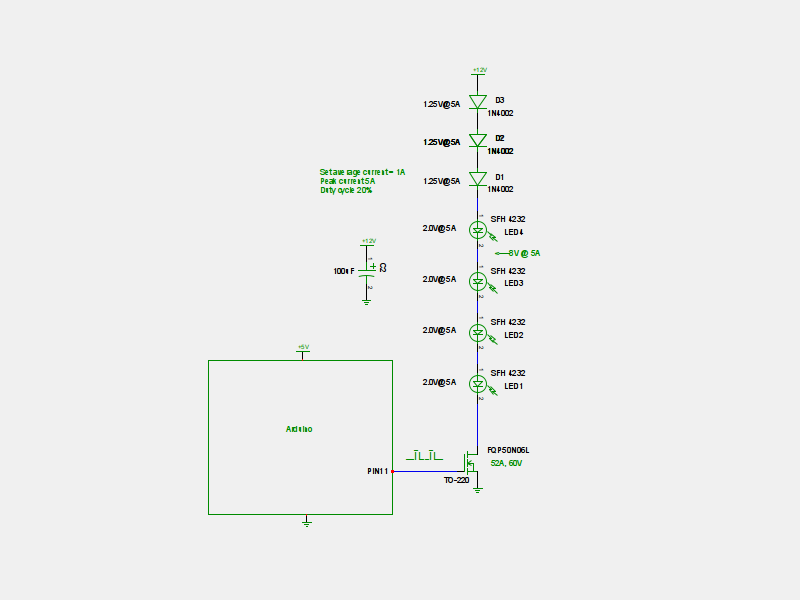 The idea is to keep an average 1A current flowing through the LEDs, while powering from the 12V automobile power. Since limiting the current with a resistor would be the same as making a cigarette lighter (way too much power and heat from the resistor), I'm using duty cycle as the means of regulating. The LEDs can handle 1A average, but 5A peak. So i'm setting up the LEDs via the forward voltage to pull 5A. The 1N4002 are simple rectifier diodes that are used to drop 1.25V each at 5A. They are also rated for 1A constant. I could have put in at least 1-2 more LEDs but they were too expensive. 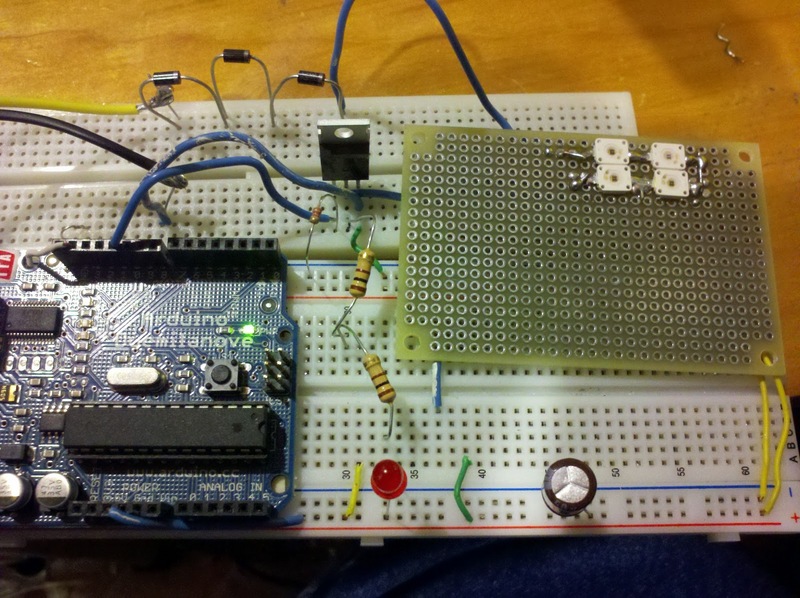 I'm just using an Arduino during prototyping to create a variable width 5V pulse that I can control easily. Arduino Duemilanove Board This is a simple programmable microcontroller that anybody could use. Buy it and plug it into your USB, load the free software and send the program. Eventually this could be a hardwired oscillator. The FQP50N06L is a huge switching transistor that is driven by a 5V input swing and has <0.05 ohms on resistance. It can handle 52A at 60V. 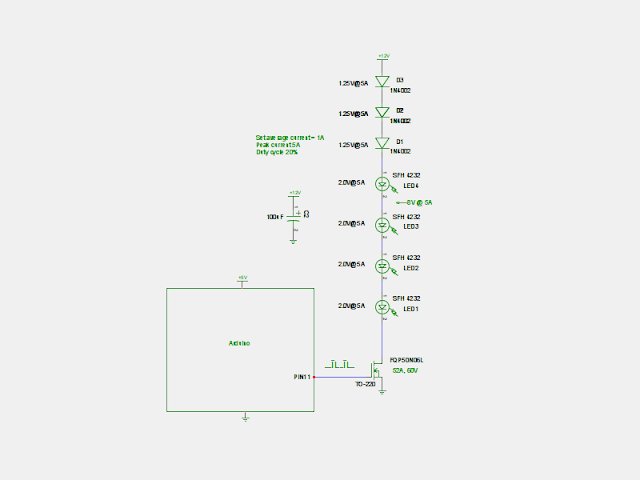 A6264 Automotive Stop/Tail LED Array Driver http://www.allegromicro.com/en/Products/Part_Numbers/6264/6264.pdf However this one only sources 100mA, it would have been perfect for my previous 100mA project :-(, but I need 1A for this job. Cypress CY8CLEDAC01 http://www.cypress.com/?docID=24622, also needs an external switch. I'll keep looking, I haven't found a part yet that I like, so i'm sticking with my circuit. I'm going to have to solder up the LEDs to even get started, as they are surface mount. Here is the embarrassing kludge of the Arduino breadboarded to the NMOS switch, 1N4002 diodes and wired to the four LEDs soldered to a vectorboard. I also put in a visible red LED in parallel just so I could see when it was on. This jig was just so I could make sure the LEDs were working before I went on. 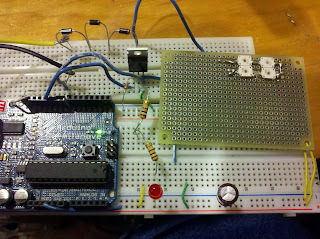 I also added a 2K resistor pull down to Arduino pin 11 to keep the power off to the LED when the Arduino is booting. Zowie! That is bright looking through the camera! Haven't adjusted the power yet, no idea if this is max. Components do get a bit warm. I did notice like the other 850nm diodes, they glow a faint red when turned on. This caused me to discard the last set, but I have since learned that nobody will see a faint light outside. 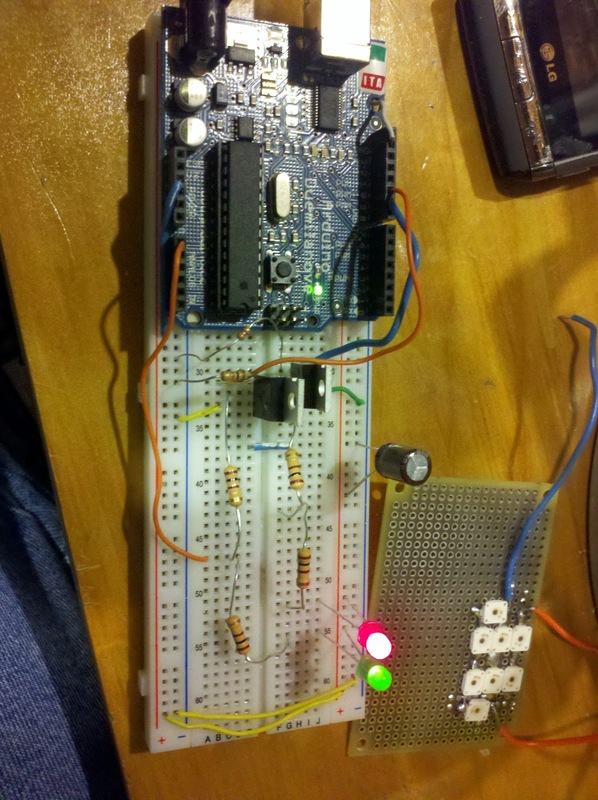 This is the Arduino program that toggles pin 11 to power the LED. Nothing to it, just a blink program. I also found that when I flash the LEDs at a slow rate, when I try to take a picture the automatic exposure control of the camera gets really screwed up. That is a good thing! I don't know if the speed cameras have automatic exposure control, I assume they do, and how much in advance of the picture they set the exposure. Normally exposure control is a sensor running and integrating the scene over a long time. Long time here means ten milliseconds up to a second. What I want to happen is to trick the camera into not seeing the light, and then blinding it when the picture is taken. Now that gets me back to trying to detect the camera flash, which is just not going to happen at a distance in an outdoor environment. As I calculated before, a speed camera is going to have a pretty short exposure to catch a moving car without blur. An idea I will explore is constantly ramping the brightness up and down at a high rate, or having multiple banks that flash and ramp brightness. At least one bank must be on all the time to be sure the camera doesn't take the picture at the wrong moment. On second thought, there is some possibility that might work as well, by tricking the camera into thinking the scene is bright, and then make it underexpose the picture. Seems a little shaky, will require testing. Decided that speed camera vendors must sell their wares too, and provide data sheets to money hungry municipalities. A little google work found one! Turns out it can use an INFRARED flash. So that explains why I can't see the flash. It also confirms that an Infrared LED will not be filtered and should be effective. Answers some critical questions. 1/1000 shutter speed, 0.3sec to get the exposure right, 12bit dynamic range and a CCD sensor (CCDs are sensitive to bloom, meaning flooding of light across the sensor when it is too bright). Now I have enough information to do some math with some wild guesses to see if there is any hope. http://www.mathsisfun.com/geometry/steradian.html has some W/sr equations. I'm not totally sure of the flash calculation, still looking up resources on flash intensity. However the result so far is that the LEDs will be 10X brighter than the light reflected from the flash off the plate. Not bad. I think I'm being very generous about how much power makes the return trip, since I'm not accounting for spreading. Now keep in mind the camera advertises a 12bit dynamic range, which is 2^12 =>4096:1 signal to noise. As a former camera designer, I know that is BS, a camera really has at most a 2^11 usable range, or 2048:1 and that is being generous if the scene and settings of exposure are optimal. The output ADC may have a 12bit range, but the scene content can not be that large. You can get maybe 10K electrons in a CCD pixel, and have a noise floor of 100e reading them out. Any signal down near the noise is not going to be sharp enough to get you a ticket. The scene will be centered somewhere in the middle if they got the exposure correct, so count on 100:1. All that said, the camera can still distinguish items in the scene that are 10:1 in brightness easily. Now a human has to look at the photo, and it is a matter of how much they process the image. A human can only see about 2^6 or 64:1 dynamic range. Conclusion. There is hope that the IR LEDs will be bright enough to mess up the picture. I could have a lot of errors in my assumptions, but still we are in the ballpark to be effective. Got four more SFH4232 diodes and wired them up with the other four in as tight an array as possible. Hand soldered the surface mount components, and I'm disgusted with my solder job. However it should work. In a final product a small PCB would allow you to pack these closer and make a ground plane for a heat sink. The diodes have a heat slug on the back that I'm not able to take advantage of. My plan is to use the metal license plate and frame sandwich to draw out the heat. Next I have to polish up the Arduino's control program. I want to flash the LEDs and sense the current back to the Arduino in a control loop. This is how the commercial LED drivers work to regulate the current. The power is so high that a few seconds of messing up the code could blow $100 worth of LEDs, so I'm going to test it with some low power indicator LEDs first. 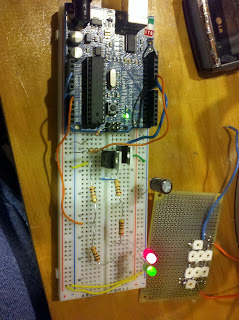 Breadboarded up the Arduino with two FPP50N06L switching transistors. Worked right out of the box, checked it on the scope. Now the frequency is 3.9KHz and I can just use the analogWrite() function without running a loop as I did above. That way I can save the brainpower of the Arduino for my control loop. Add the analogWrite to the LEDs, the analogRead for the sensor, and a serial write. I'm going to load this and see if this slows down the PWM frequency on the scope. Still 3.9KHz. Sweet, the computational overhead is not messing up my flash rate. This should work. Got some 5W 1ohm resistors so I could measure the current in the diodes by measuring the voltage drop. Made sure not to buy wirewound resistors, because they are inductive and since i'm switching the current through them it would ring like mad. My first measurement of the current was only 0.39V -> 390mA! I wanted 1A average current. The forward voltages are not stacking the way I expected. Ramped up the duty cycle to 40 and got the current to 790mA. Diode array is getting WICKED HOT! I'm going to have to mount this on the plate frame and get some heat sink action or I'm never even going to be able to test this thing at full power unless I can get the heat out. 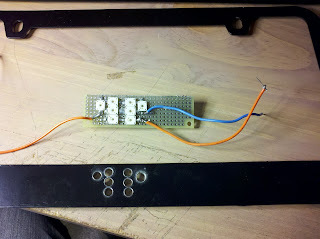 First I have to drill out the license plate frame in a hole pattern that matches my hand kludge diode array. I will take a full size picture and tape it on, then drill. I used the black frame as a practice, since my plan is really to use a chrome license plate frame of the same type. The shiny chrome will disguise the LEDs better than black. Here are the holes I drilled with the drill press. Drilling went smoothly, the pot metal license plate frame was easy to drill. However the metal was shiny under the black and despite my best efforts the paint was marred in a few places. If I was going to use this as a final project, it would need some touch up paint or to be taped before drilling. Taped in the light array as a mock up just so I could dissipate the heat and take some photos. You can see the black electrical tape if you look. 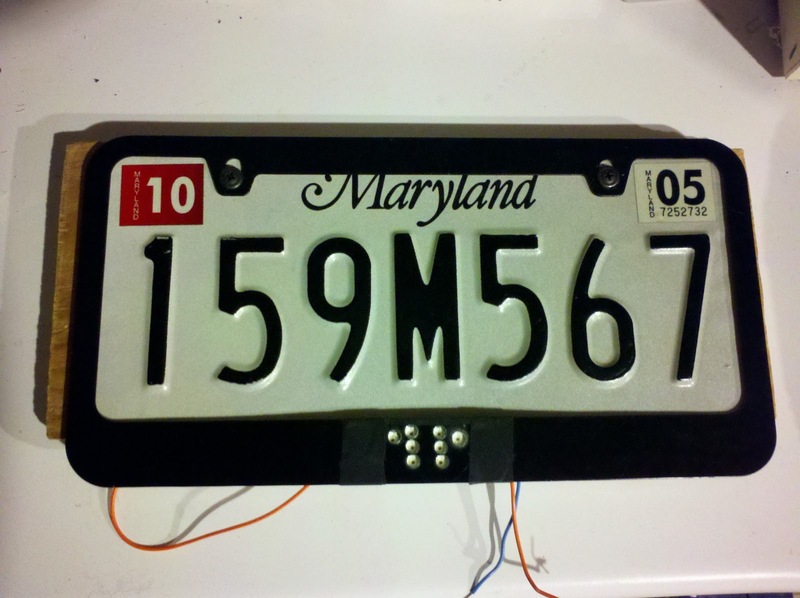 Here is the frame, light array and license plate assembled without turning it on. Powered up to 800mA per diode. Max is supposed to be 1.0A, so not quite full power. Frankly I'm not impressed yet. The previous version seemed to be just as effective at less than half the light power spread over a larger area. What is going on? The camera I'm using to photo this is my cell phone. It does an auto exposure, which I've said above I don't think the traffic cameras have time to do. It closes down and I get the same picture no matter how bright the light is. 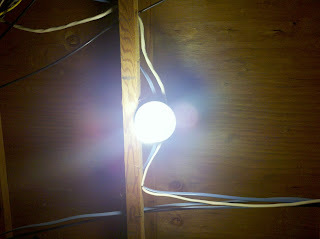 To prove my point, I took a picture of a 100W light bulb on the ceiling. OK it was really a 23W compact fluorescent 100W equivalent. 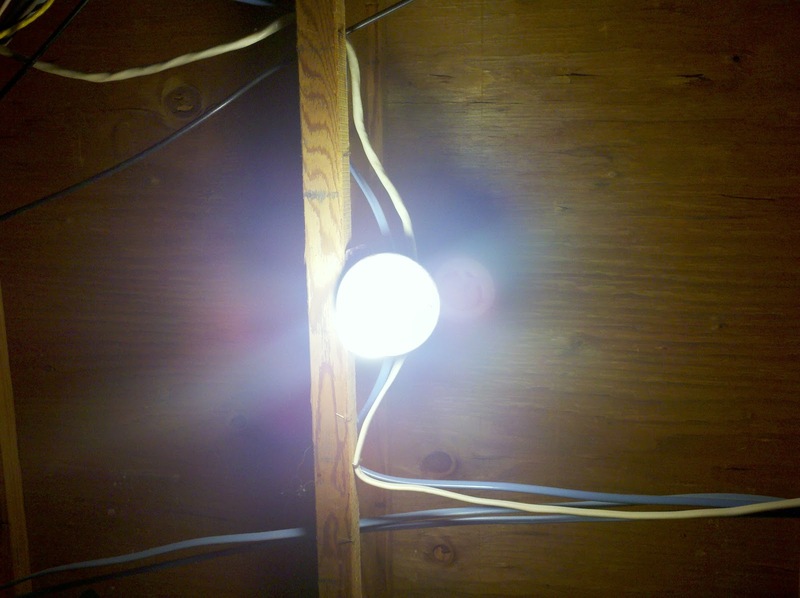 You can see the wood grain an inch from the bulb, and this has 4X more power than my LEDs based on input power. Now the LEDs may be more efficient than fluorescent, but the camera sensitivity is higher to visible. I should have done this before we went on this ride! So is the project busted? ... no I don't think so. It depends a lot on the camera and photo conditions. As I said earlier, taking a photo of a moving car in outdoor environment and reading the plate is not easy. It needs a high performance camera that is going to be on the edge of working, so it won't take as much to mess it up as it does the camera in my basement. First I need to find a camera without automatic exposure. One way this is quite likely to work , is to actually drill holes in the plate, and put the IR LEDs behind the numbers. My state has white plates, so it might not be too obvious. The number behind the LEDS won't be readable, that is for certain. That is a much easier block than a light near the numbers. I'll try that next. Try that idea at your own risk, I'm not telling you it's OK to do this. 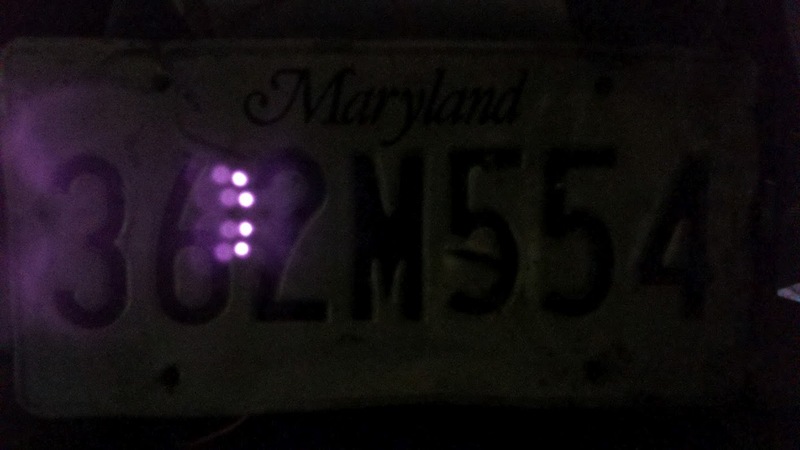 Here are some shots of a license plate I found by the side of the road, drilled with four high power LEDs behind it. Since the plate is white and the LEDs are white they are pretty invisible until you try to take a picture. Here is the plate at night, taken from a cell phone camera. The shot is dark because the LEDs make the camera adjust to be very dark. Can't wait to see your progress on this... I came up with a similar idea today, but was planning to use several high powered IR LED's pointing downwards and across the plate. If the plate is highly polished/lacquered, it might create enough glare to obscure the digits. Great work - keep it up! Try bouncing off the plate from 4 directions and add some refraction. Light up two sides, alternating to save power and produce less heat. but if you get busted it's might be trouble. another option is to look into micro-beads - some tiny glass/poly balls as a micro-coating. Then illuminate from the side. It might act like a diffuser..
Siliconfish-- I am so happy I found your blog, was about to try something similar. I agree with Yep, perhaps directly lighting the plate to over-expose it might be the way to go. BTW, while you obviously know a lot about electronic circuitry, you apparently have a bit to learn about flash slave sensors. Their response time is measured in microseconds, so no problem keeping up with a slow-poke 1/1000 sec. shutter duration. I have used them to sync 1/10,000 sec exposures (open shutter, four Vivitar 285's set on 1/16 power which renders about 1/10,000 sec flash duration) and there was no detectable ghosting on a hummingbird's wings from slave delay. The problem you will have with a flash-based system is that newer speed cameras also take video while they are taking still images. If you have a flash slave, chances are they can get your plate off of the video, though it requires more time and trouble. The solution would require a combination of constant LED's to overexpose the video and flash slave to overexpose the still image. I developed a flash slave system to overexpose plates. The slave was a very expensive one ($150) that was able to sense a trigger flash from up to 300 feet in bright sunlight and worked perfectly. A police officer friend of mine who worked with the DC police mounted it on his motorcycle and tested it by driving through red light cams and speed cams. He looked at the images (he worked in that department) and his plate was completely blown out on every image. DC still has mostly still-only stationary cameras, so this might be helpful there. I live in the People's Republic of Maryland as well, we should get together some time. What's your favorite Starbucks? Great input! I guess I never really used slave flash devices, I thought the bright sunlight would rule it out, and detection of the flash would be impossible. IRs work great on video cameras, but marginal on still photos. I think you are right, you need both. 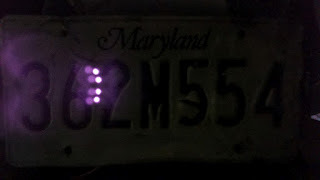 economic LED’s alternating, overlapped-pulsing, invisible infrared (940 – 950 nm) light bounced reflection and refraction "off" license plate. Battery or 12 Volt powered. don't need a very bright light; suggesting the 8 - 13 micrometer wave length; want a 12" bounce zone as wide as possible. If you can produce a prototype I will fund a patent and development. In doing a little more research, I have found that some systems are using flashes from huge arrays of high-power infrared LEDs instead of conventional xenon strobe tubes (http://www.alibaba.com/product-free/100475421/High_Power_Infrared_IR_Strobe_.html). While the slave sensor works extremely well with xenon, I'm not sure how it would react to the LEDs, as it senses the ramp of a xenon flash to trigger. 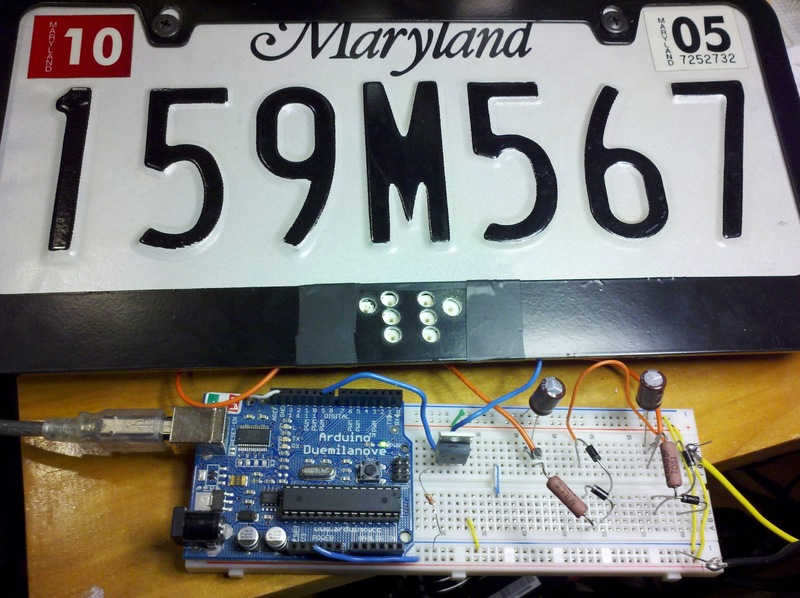 Yep - It is certainly clear that if you wanted, with $5 of LEDs, a dedicated LED flasher IC, a license plate hooked to 12V auto, you could make a product that costs <$20 in materials. I would have paid $100+ for it the day I got my tickets I was so mad. In fact with all the junk I bought having fun with this product, I did spend >$100. So there is your proof. It would protect you sometimes from speed cameras, and probably always from security cameras and tollboth cameras. It would be better than the sprays but not foolproof. Anyone who wants is free to use anything they learned here to do it. Send me a note when you make your first $1M or get sued the first time. I'm going to stay under cover in the field of fun, education and subversion. Have fun! Ow! Nice job! 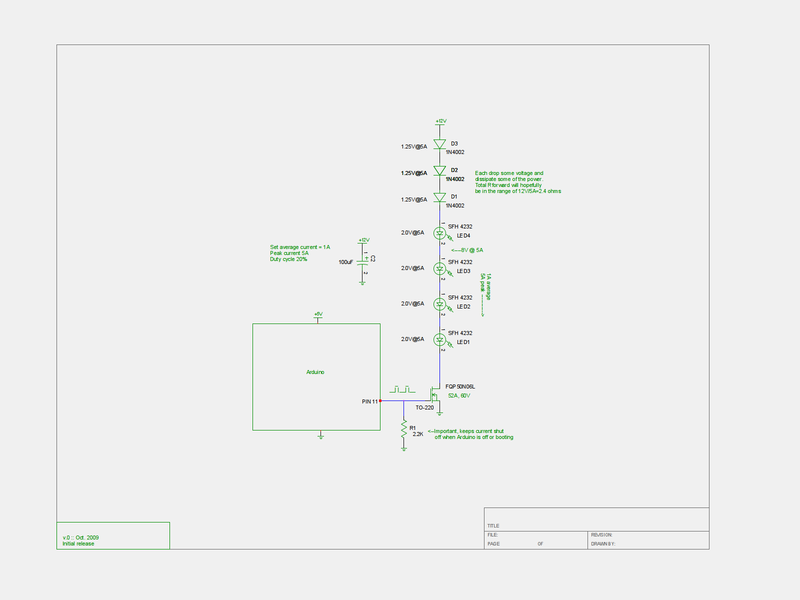 I found your blog looking for LED circuits for helping security cameras, took a look at your first attempt and now I'm very curious to see the outcome of this project. I won't comment on the math you're using, I'm familiar with it but I don't have all the knowledge to discuss (the way I see, it's flawless)... but like others above suggested, what do you think about turning the LEDs to light the license plate? I've never seen an US license plate, but here in Brazil they are metal with a thin coat of greyish-white semi-clear/reflective paint for the background and a less reflective black paint for the numbers. If you toss an insane amount of light in the reflective area, wouldn't it flood the light making it impossible to shoot a nice picture of the plate? Reading your work, I started to think about some hi powered IR LED spot (with lens) converging the IR light in some part of the plate. Would a lot of light reflect the metal behind the black paint? Sorry if this sounds silly... but in my head it just might work, uh? 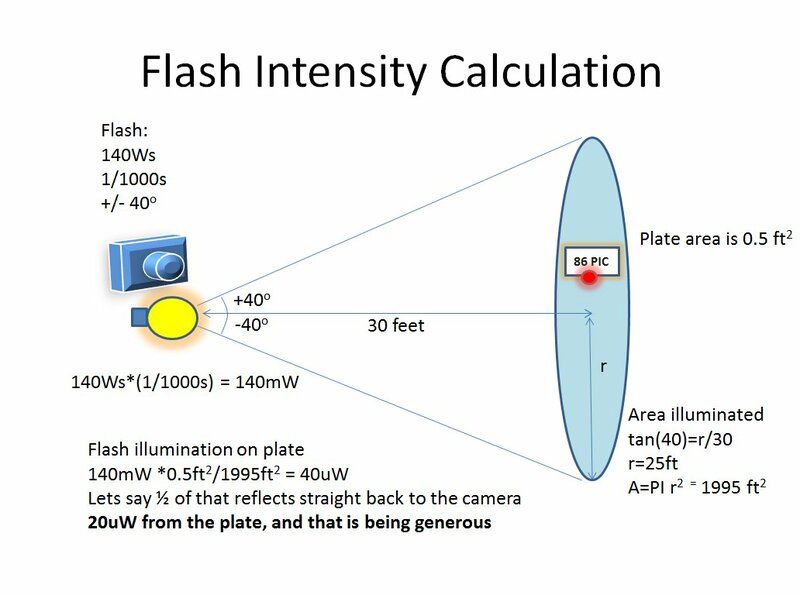 Siliconfish- I was talking about the slave being able to detect the flash from an LED flash on a speed camera, as the "ramp" of the light increasing is different from that of a xenon strobe. If I find a speed cam equipped with one of those newfangled LED strobes, I should take the slave unit and a flash out there and sit by the unit to see if it triggers when the LED's go off (I should probably be wearing a disguise when I do that...). BTW, for the motorcycle test, the flash was pointed directly at the license plate itself, and not at the camera. Since it was so close it easily overwhelmed the exposure, even in bright daylight. Since it went off at the same time as the traffic camera's flash, it just looked like a reflection of that flash on the plate. It was on a rack on the back of the motorcycle, and the flash was aimed to cover the license plate almost perfectly. My friend said it looked like there was simply nothing on the plate, like it was blank. I made (but never used) an adapter that goes on a trailer hitch mount. If I ever stop being paranoid about all the new capabilities that they're building into the speed cams nowadays, I might work up the guts to actually mount the system on my car. With all the new cameras they're putting up (in the past six months they've put up 180 new ones in Montgomery County, MD, alone, and that's along with the multitude they already had), normal drivers who haven't gotten tickets in decades are being dinged several times a month. I'm sure people would pay well over a thousand dollars for a system that could reliably defeat the cameras, if it could be done with a minimum possibility of detection. Keep up the great work. We'll solve this problem yet. I have been wondering about this. I always figured it would work best to invisibly flood the plate itself to overexpose it. how did you get on with this project? how did it perform at night? Are there any other tips you can share? Which brand of LED you found to be the best option? and if you happen to have any photo's from the plate at night :)? I explored flashing in this and my earlier post. Think about and tell me if I'm wrong, but the net result of flashing is zero. You could have three banks on 1/3 of the time, or just turn them all on at 1/3 the brightness. 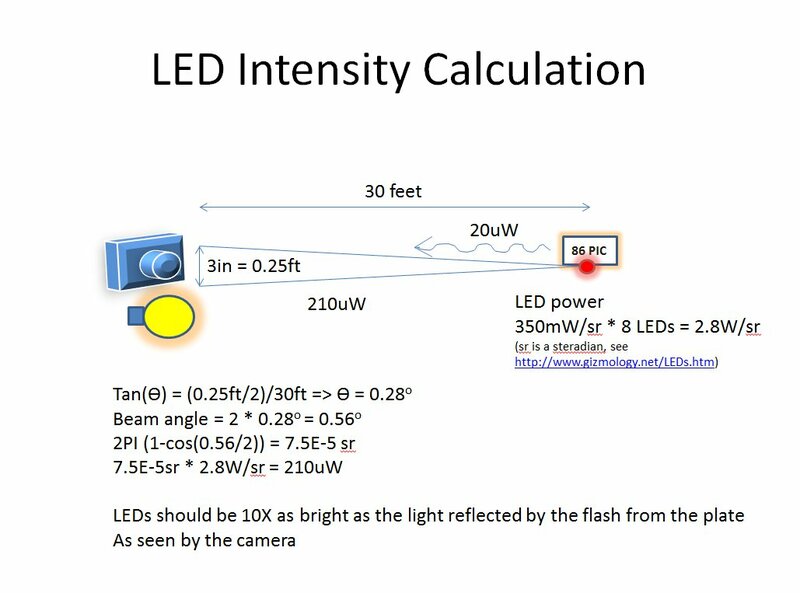 The wear on the LEDs is the same, the light is the same, and your design is a lot simpler. With flashing you just have to hope the two pictures they take obscure the same part of the plate or you are screwed. Let me know if logic leads you differently. Tip. Heat is your problem. LEDS get hot if cranked up. Build a heat sink. Decide if you want to risk drilling holes in your plate, that works better. I need to make another post with that solution. I decided to go commercial with this product. i thought this idea in 2008, when i used a 2W 808nm laser diode shine IR laser on the plate, you can see a very weak faint of red light in the night(when focused), nothing in the daylight. for the result, when i switched on my night vision camera, the entire frame is white and as bright as the sun, even at 100 meters away, i can still barely see the outline of the car. my plan is to use one 2w laser diode, always on, towards the plate for IR cameras, and a slave flash device for white light flash cameras. since a single laser diode produces much less heat than a bank of hi power ir leds, the final product could be very small. i would use a magnet to stick it next to the plate illuminators above the plate. I live in Australia, i recently got $400 worth of tickets just for 7km and 11km above the speedlimit. most of speed cameras in Australia have switched to IR flash because of drivers complain about the white light flash blinding them. Reading this, it reminded me of research that the department of homeland security is in. Back in 07, they funded research into an led light that incapacitates by varying the intensity, the pattern and emitted colors to subdue an unruly person ( http://www.technologyreview.com/computing/19142/). What I take from the article is could the led circuit benfit by having various branch circuit pulse at various rates so the AGC is constantly hunting ? Have you any further information on your product? The 2w laser diode and a slave flash combination? I have found both threads very fascinating! couldnt something like that idea be helpful? like is used in Double A battery LED flashlights ? its been over a year.. any modifications revisions etc?? Sad to see such few updates on this very interesting subject. I must admit, I thought of this earlier today, and after doing a Google search to find if others have tried it, found only a limited number of discussions - this being the top listed. LED's seem like a possibility - but why not go full bore, and use an IR laser? Just purchased three for USD15.00 w/free shipping from China. 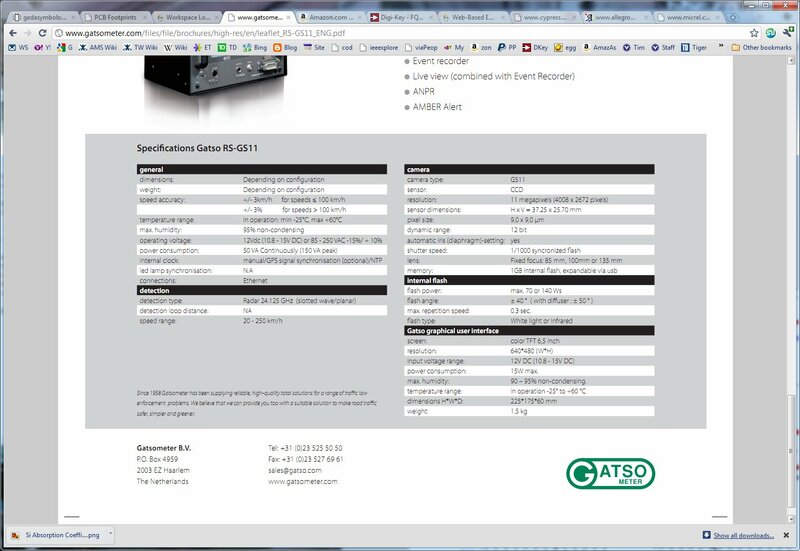 50mw no less. They're focusable dots, and with the proper driver, can be powered with the 12V found on a license plate light. By shining the diffused laser dot directly on the plate, it ought to reflect an overwhelming amount of IR light in all directions. "Nothing shall be placed upon the face of a Florida plate except as permitted by law or by rule or regulation of a governmental agency." 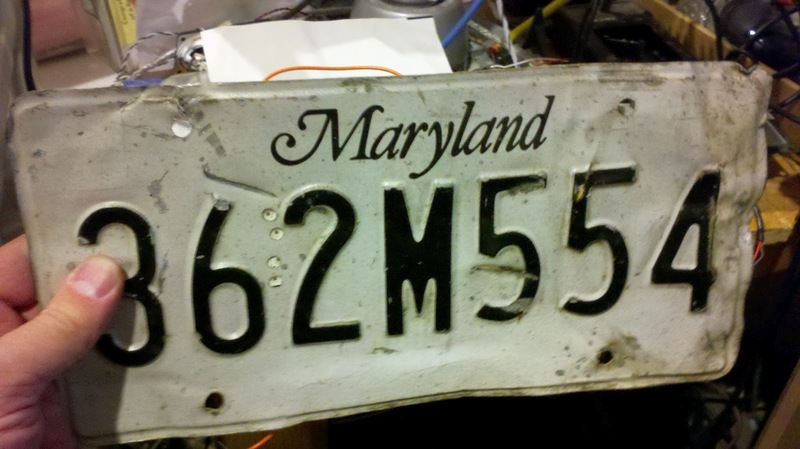 "...the registration decal, and the alphanumeric designation shall be clear and distinct and free from defacement, mutilation, grease, and other obscuring matter, so that they will be plainly visible and legible at all times 100 feet from the rear or front." Now, I'd argue there is nothing physically on the face of the plate - and whether day or night, would still be plainly visible (to the naked eye) and legible at 100 feet. Besides... "A violation of this subsection is a noncriminal traffic infraction, punishable as a nonmoving violation as provided in chapter 318." Non-moving violation (i.e. parking) ticket vs. redlight/speeding ticket. No brainer. Ok, the 5mW 980 IR laser arrived. Apparently, IR begins around 750 and goes to around 1000. 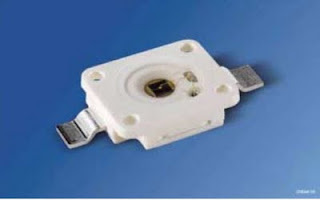 The CCD and CMOS cameras peak sensitivity is between 750 and 850. So, the 980nm, while visible when shined directly at the camera, was not in right range to overpower the camera. I'm using my webcam, cell phone cam, and some FOSCAM IR-driven security cameras as test units. So, I ordered a 70mW 750nm laser (USD12.00). That should get here by week's end. Yeah sorry to say that info was buried in this and the previous post. You need something as low wavelength as you can to get the best performance. Make note that you will be able to see a dull red glow from anything 850 or below. Probably it will look like a custom decorative light to the naked eye. I think it was mentioned here, but one thing that struck me in both this build and your last was not pointing the light at the license plate, basically trying to over-saturate it, much like putting a powerful flashlight directly on something makes it unreadable. The tough part of course would be fitting it all together, I was thinking a spacer between the plate and frame, just big enough for the bulbs. Someone earlier had mentioned a diffuser, and I had thought about just a proper-thickness piece of plexiglass, again between plate and frame, with the bulbs lining it. The plexiglass should act as a carrier/distributor for the light over the surface of the plate. And since it's just plain plexiglass, it wouldn't obscure normal vision of the plate (or shouldn't), so shouldn't raise any eyebrows in areas where smoked/obscuring plate covers are illegal. A lot of people have suggested I should have reflected the IR light off the plate. The reason I didn't do this is that light is lost in reflection and scattering, the plate is not a mirror. I wanted as much light as possible to hit the camera, so of course, you point your light source right at the camera. I was also trying to exploit the phenomena of "blooming" when you overwhelm the CCD well of the camera with so much charge it leaks into adjacent pixels and spoils the image. Perhaps you could add enough light to exceed the dynamic range of the camera over the whole area you light, but that takes much more power. I thought I'd end up just illuminating the plate better and making a nice high contrast picture for the police since the plate has black and white areas. But somebody should try it. to siliconfish, so do you have finish the project ? in EU we need this type of product !!! I'll let you know. I ordered it last month, and it arrived today. First thoughts, it's nothing more than about a 10" cut LED strip like you can get from China - the RGB version, except this is single channel IR. I have real reservations about weatherproofing. It has a sticky backing and the clear silicone coating, but I have similar RGB strips that failed due to moisture - and they're used exclusively inside. "Myflorida.com" advertising (yes, FL advertises on their plates). Our local expressway uses ITOL (image toll) where if you drive through without a transponder/sticker, they snap a photo and bill your account (or mail you a bill). It's a great way to test the plate. I drive through with it off, I get a debit on my sunpass account (with an image) within minutes. I drive through again with it turned on. If I get no notice on my account, I'll know it works. Did you look at your TOLL bill yet to see if it showed up? I live in Texas and we have the same type toll systems. I Was thinking if one didnt work then maybe install 2 of them. One on top and one on the bottom. Please let me know if it worked for you or not. I hope it does I am tired of paying these tolls when they said once the toll road was paid for they were no longer going to charge us. @morebuzz - I drove through to toll at several points, with it off at one, and on at another. After looking carefully at the itemized billing on my sunpass, I found that it's not nearly as "instant" as I thought it was. Turns out most of the debits to my account are posted about 5-7 days after the actual travel through the toll. I drove through 3 days ago. So, it's just a bit of a waiting game for now. The moment I see something on my account I will post here. Please let me know ASAP either way if they show up or not. I am very interested in getting the Ir plate blocker that you bought if it works. Was even thinking about getting 2 one for the top of the plate and one for the bottom if it seems like it almost blocked yours. I figured if the amount of IR light was doubled and the single almost blocked it all then 2 probably would. So how much was the one you ordered and how long did it take you to get it? Is it coming from China or Europe? I look forward to hear your response. Lets hope this product works like it says it does. The GOV. gets enough of our money. Also how easy was it to hook up? @morebuzz - good news. Of the three tolls I went through, only the one where I had the plate light off showed up. So, it appears to be working. I say "appears", because I don't know if they may still show up. It's possible that clearly readable plates are automatically process (with OCR). And those that the software cannot get a clean read on, may be manually reviewed. If that's the case, the other two may still show up - just at a later date. So I wouldn't say that this is 100% conclusive. If they haven't shown up on my bill by next billing cycle, I think it's safe to say it works. That being said, it seems to work with my specific toll system. I don't know if it would work with flash-based red-light cameras (I'm not willing to try that unless a new one goes in and they're in a warning-only phase). But, truth be told, in FL, there's a movement happening where cities are actually starting to remove them more than install them. I don't have any more trips planned that include the toll roads. However, if I get any more opportunities to test some more, I will post the results. As far as installation, it was actually quite simple. 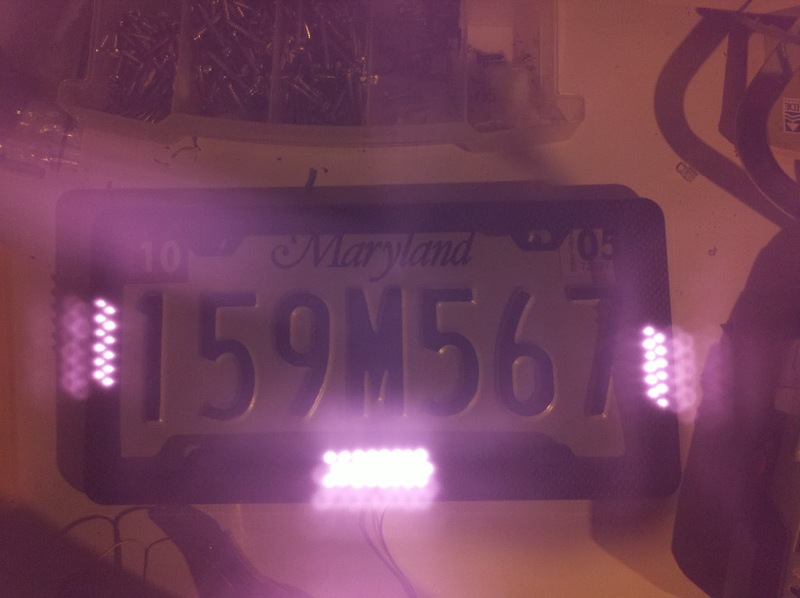 I removed the LED strip from the license plate holder they shipped with it. I then stuck it directly on the license plate (just above the numbers). I then ran the 12V (red/black) cables up to one of the screw holes in the plate to get it behind the plate. From there, I routed it up to the stock license plate illuminator light on the car. I had to extend the wire a bit, as the one it came with was a few inches too short. I then applied some white duct tape over the 1" section of wire that was visible between the end of the LED strip and the hole on the plate. It makes it quite inconspicuous. The beauty of this set up is, I can now manually turn it on or off as needed with the parking lights. When set to auto, the car will always have the parking lights on (even during the daylight). I'm going to give this some more testing time, but will likely order a few more for Christmas gifts. In fact, I may contact the vendor and find out what wavelength the IR is, and then just order a 15' roll of the LED strips from Aliexpress. Thats awesome news man. Please keep me posted on if they show up. Also if you do contact them let me know I might like to buy a strip as well. Also can I ask why you took it off the mount? Did you feel that by keeping it on the mount it wouldn't block it good enough? I am thinking about buying 2 and putting one on top of the plate and one on the bottom to give it a better chance. How much was it? How long did it take you to get it? I think i read it correctly that it came from Europe right? I think I am going to order one. I will probably hook it up so so can turn it on and off when needed or just hook it up to a light source as well. I just want to make sure its always on when I go under a toll booth. Keep in touch. I wish Siliconfish's system would have worked for the toll cameras. I would liek to build them and sell them here in Texas. Maybe I read his wrong. I think he was trying to block out the red light cameras and not so much the overhead toll cameras. if his would work for the overhead toll cameras I would build them and sell them here. Do you think they would work or does his still need some tweaking? MB - I'm afraid I have some bad news. While the two previously mentioned attempts with the LEDs on never showed up, I repeated the test several more times a few days ago. And of those, two DID show up. When my sunpass account is debited, it provides a photo of the actual vehicle/tag as a receipt. In both photos, I can't see ANY distortion or light coming from the LEDs. So, I have to go an test the wiring. It's quote possible that the LED strip is no longer working. After all, it is exposed to rain (and it did rain a lot here recently). The seller claims it's waterproof, but I don't think it's designed to hold up to soaking water/submersion. In any case, I removed the strip and put it directly on the plate. I figured the closer the lights are to the actual numbers, the better the effect. 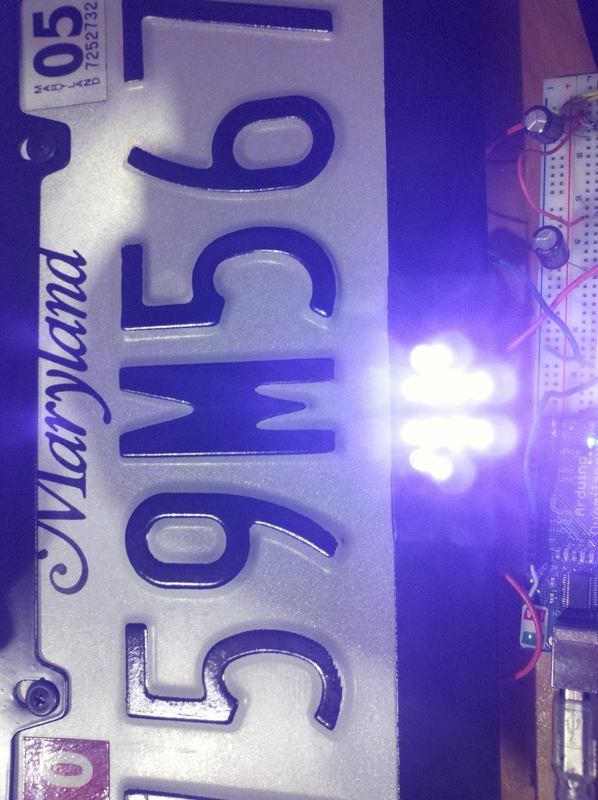 Further, the plate that comes with the LEDs is black. The actual LED strip is white. The plate is white. So, a white strip, on a white plate, it's virtually invisible. Even my neighbor (a retired cop) couldn't see it - even after I told him where it was. He had to walk up to it and touch it before he saw it. I sent an email to the seller asking for the wavelength, but no reply. I can only assume he's found this blog, and realizes that not knowing the wavelength is probably the one thing that keeping others from simply ripping off his idea. I can respect that. Just means a little more trial an error. Finally, as far as the lasers go, I abandoned that idea due to mounting issues. I couldn't find an inconspicuous way to mount the laser at a distance that made the laser dot large enough to obscure even a single number. I tried it with the lens on and off, and neither produced a dot more than about 1/3" in diameter. BTW, since I'm using the photographic receipt as validation for these attempts, I have to also be careful about doing it too often. If anyone within the billing department of the toll system is paying attention, they may notice that a specific car/tag keeps having interference issues. Since those attempts that interfere, but not enough to prevent billing, may draw suspicion, I need to exercise some discretion. Once I get a chance to verify the LED strip, I'll post back. Sounds like it could be wiring if the other 2 didn't show up on your billing. Please let me know if it just shorted out or if you think it is still working and they just figured out how to expose it better now.That is a bummer that it is no longer working. there has got to be a more full proof way to make this idea work rain or shine. if you were to put silicone on the back part of the LED lights would that help it more? I am sure if we tried to put something on the front of the lights it would hinder the brightness of the light and not block out the plate enough. GRRRR I hope this is a simple fix. I really want to order some and sell them to friends and family. if this ends up where it does not work there has GOT to be something better that will work. I was thinking about using electric glass and just flipping a switch everytime I go under one. I was really hoping this IR setup would work as I have about 20 people that would buy them from me. I hope you report back with good news. I look forward to your response..
FED UP any word about the LED IR strip? Did you test it and see if it still works? Ok, FINALLY, I've had a chance to do some poking around. Regretfully, the strips ARE illuminating - but apparently not at the right wavelength. I've checked that the strip is getting 12V, and it is. 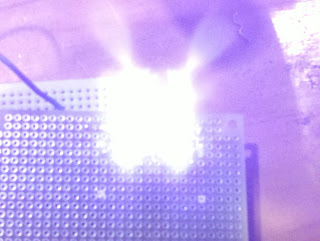 I've also verified that each of the IR LED segments are illuminating using my phone's camera - and they are. Going back and looking at my account, it's clear that these LEDs don't even show up in the photo. They may as well not even be there. I've sent a screen grab of both day and night photos from the toll authority. In the day photo, you can see the LED strip (the entire thing - not the illumination). At night, the plate looks 100% normal. No glare, no illumination, nothing. Since I have the ability to see the actual image used for the billing processes from our toll authority, I've offered to beta test different wavelengths for the seller. It's disappointing to see that it's not working, but I suspect the concept is sound. It's just a matter of figuring out the optimal IR sensitivity of the cameras. What would be neat is if they could make an LED strip where each LED has a slightly different wavelength. Start at 705nm on the left, and end up with 1100 on the right. Then see which one shows up the brightest in the photos. Alas, Morebuzz69, my apologies for taking so long to burst your bubble. Anymore news on if the LED IR strips are going to work? I would really like to know if there is a solution to this problem or not. I read both of your articles and was very happy someone else was tired of getting tickets or paying for overcharged toll prices. I had a question about your second attempt. I noticed you were trying to design something against the red light cameras. I just wont something that would work against the overhead toll cameras. Would either of your designs work for that if I were to add 3 more sets. One on each side of the plate? I was also thinking instead of putting the IR lights on the face of the plate frame could I use a 1/2" plate frame and put the bulbs on the inside of the plate so the bulbs would be kind of facing the plate? I Was thinking if I used 20-30 of them around the inside rim of the plate and used a stronger watt bulb. Do you think that would work? Or maybe using a stronger watt bulb and put them in the license plate light sockets? I have seen pictures that if you use enough IR lights it creates a "halo" thats what I am looking to make. Also I have seen people responding they want to use a certain type laser facing towards the plate. I am guessing this would be pointing it on an angle so it would be spread across the plate and help blind the numbers? I guess I am kinda wondering how a laser would be used in this application? Any help? Your input would be informing to me. FEDUP. I also read your comment about using a few lasers and pointing them directly and the plate. I am guessing this would just cause a "white glow"? Have you tried this application yet? If so can you explain how you did it and any parts needed to get that done? If not are you still planning on trying it? I would love to see the results of that as well. Just curious..Thanks for your great input man. If transparent license plate covers are allowed in your area, the thing to do is to use a cover made of something like lucite. If you etch the lucite just right and shine the lights parallel through the lucite (the LEDs are mounted along the edge, shining into it), then the IR light will be deflected at the etchings. That will cause the light to exit where the plate lettering is instead of beside, above, or below it. This should be much more effective. Hunter did your solution work? I am also trying to beat the TOLL road cameras.. I dont care so much about the RED LIGHT cameras. let me know if you are having success. Two things here: one IR cameras use IR to take pictures at night. Your cameras aren't. So you are not doing proper QA when testing. You will probably get the results you want if you take a picture with a IR camera. Second (someone else suggested this) use a plate to capture the light beneath. I would suggest putting the LED's in a solid plastic block in front of the plate to refract the light better. Hunter - that looks awesome. Did you use IR LEDs? So this isn't visible with the naked eye? Your camera has color in it, so I assume this isn't an IR-specific camera (like the toll cameras). Have you tested it on any toll roads to see if it works? The problem you are having is that it is infrared and all your cameras are designing with an internal coating to block out infrared. You need to coat the plate with the same clear coating which blocks infrared and ultra-violet a and b. but not visible light. That way their camera will see a blacked out plate and you can still see it. What a shame that this thread has been hijacked by spammers. Unsubscribing now. Was always excited to see movement here... but alas, the spammers win again.